Cape Resorts has put together a whole list of exciting and educational excursions that allows guests to experience the incredible area that’s teeming with life. Known as one of the top birding areas in the entire world, there is so much the region has to offer in the terms of getting close to nature. One of the newest excursions focuses on one of the “wonders of the world”, the prehistoric horseshoe crabs. Every May and June the prehistoric horseshoe crabs crowd moonlight beaches to lay their eggs, as they have for nearly 500 million years. Older than dinosaurs and actually more closely related to spiders or scorpions than other members of the crab family, the largest population is here along the Delaware Estuary. The females lay 100 tons of nutrient rich eggs on the bay beaches during full moon high tides in May and June, which are then fed on by migratory shore birds who visit the area during the same time every year. The birds make a miraculous 10,000 miles to their breeding ground in the Arctic and arrive at the bay after a 250-mile flight from South America. The feast gives them the energy to complete the trip. Cape Resorts will offer guests an up-close look of this amazing natural occurrence that only happens right here. Guests of all ages are welcome for the walks under the full moon where they’ll learn all about this incredible creature and see it in action. 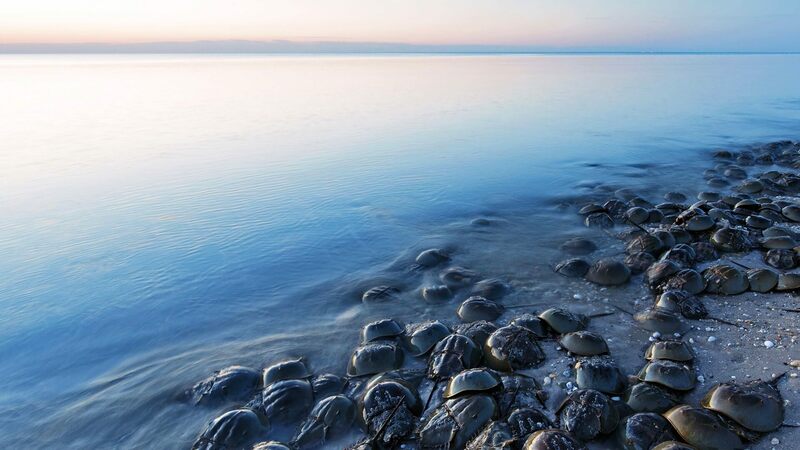 Witness this amazing spectacle of nature – the shorebird migration and horseshoe crab spawning season. Limited Availability. Horseshoe Crab Migration Tours are for Cape Resorts Guests only. Before the walk starts, you’ll learn about the natural history of horseshoe crabs and their importance to our Ecosystem. The walk will take place on the beach along the waterline. Our walk will cover 1 km of beach (walked in both directions, so 2 km of walking) and will take approximately 2 hours start to finish. For more information, please call our Concierge at (609)884-6542.